All of these �tried and true� methods will simply make more rapidly growing plants from each tiny piece of root. 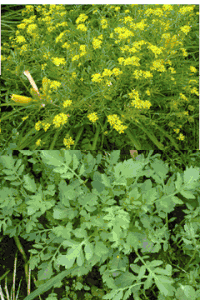 One gardener reported to us that Roundup� has no effect on this weed other than to "make it mad" and encourage more root divisions. Rorippa sylvestris grows so fast that it can completely smother your garden in a season. The photo shows an infested, imported Stella d' Oro the first summer after planting. You can see a daylily bud on the left side of the top photo. This single plant had already been engulfed and was being smothered in just a few short months. The links below have photos which should help you identify any plants in your garden. Click this link to go to United States Department of Agriculture for more information.